HICKORY, N.C. - On Opening Day for the Hickory Crawdads at L.P. Frans Stadium, the Intimidators struggled at the plate while the 'Dads used a four-run fifth inning to propel themselves by Kannapolis Thursday night, 6-1. The fifth frame started with an error at third base by Intimidators' Bryce Bush, as Taylor Varnell (L, 1-1) skipped a pitch through the dirt that nicked Pedro Gonzalez a few pitches later, putting runners at first and second with no outs. On a 2-1 pitch, Miguel Aparicio doubled, followed by a Frainyer Chavez single to right field, giving the Crawdads a 3-1 lead. After a mound visit and a single, Chavez scored from third as Chris Seise got caught in a pickle between first and second, putting a cap on the four-run inning. Two innings prior, the Intimidators tacked on the first run of the ball game with a triple off the bat of Steele Walker, bringing in Lenyn Sosa who reached on a seven-pitch walk. In the sixth, Varnell exited after giving up five hits and four runs, handing the ball off to Jason Bilous. The 2016 National Champion out of Coastal Carolina surrendered back-to-back jacks with two outs, as Sam Huff and Pedro Gonzalez added to the Hickory lead, now 6-1. Crawdads' Jake Latz (W, 2-0) finished with eight strikeouts through 5.0 innings, while only giving up three hits and one run in front of 3,000 fans at "The Franz." In the ninth, Walker collected his fourth double of the early season to lead off the frame, only to see three straight strikeouts by Intimidators' batters, three of the 17 strikeouts on the night for the visiting team at the plate. Kannapolis' Ian Dawkins also finished the night with two hits, as Walker raised his average to .320 through the first seven games and Dawkins to .240. 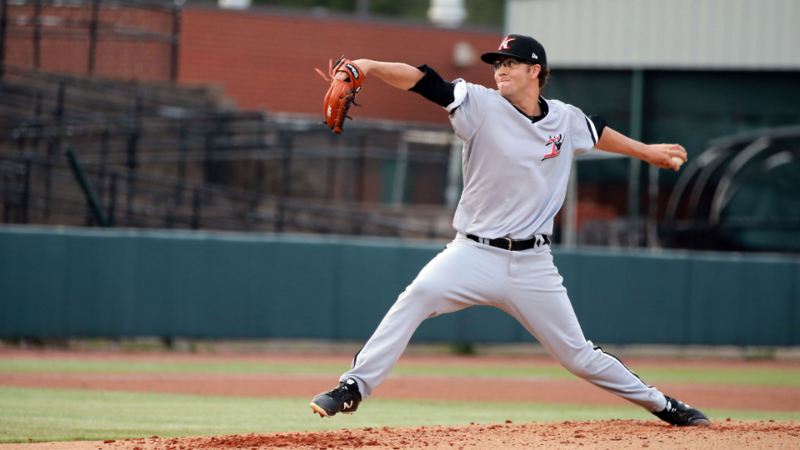 Kannapolis will send RHP Davis Martin to the bump against Hickory's RHP Jean Casanova. First pitch is set for 7:00 p.m.